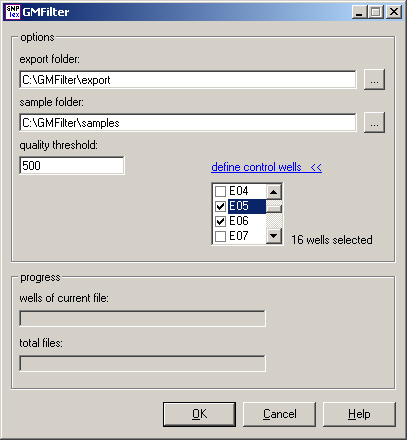 GMFilter is a Windows program for improving GeneMapper® analysis of 384 well SNPlex™ plates by removing bad wells, i.e. wells having a low signal intensity across all assays. This is done by creating a normal MS-DOS batch file, which deletes .fsa files of wells having a median signal intensity below a specified quality threshold. Afterwards the GeneMapper® analysis can be repeated with a standard analysis method (we recommend "RelaxedRules", see below). GMFilter is free software; you can redistribute it and/or modify it under the terms of the GNU Lesser General Public License as published by the Free Software Foundation. GMFilter is not for commercial use. Teuber M, Wenz MH, Schreiber S, Franke A (2009). GMFilter and SXTestPlate: software tools for improving the SNPlex(TM) genotyping system. GMFilter runs on all Windows platforms. It has not been tested under Windows Vista.